Creese, Mary R.S. and Creese, Thomas M. 2006. British women who contributed to research in the geological sciences in the nineteenth century. Proceedings of the Geologists' Association, Vol. 117, Issue. 1, p. 53. Thompson, S. M.: “A Plea for Irish Glaciology”: Irish Naturalist, vol. iii, 1894, p. 30. Thompson, S. M.: “The Belfast Field Club in Donegal”: Irish Naturalist, vol. iii, 1894, p. 226. Thompson, S. M.: “Geology” [of Co. Galway]: Irish Naturalist, vol. iv, 1895, p. 225. 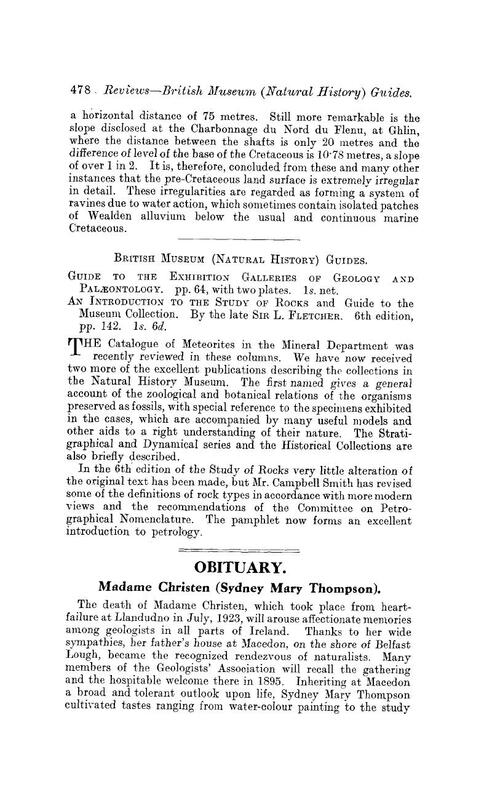 Thompson, S. M.: “Glacial Geology of Kerry” [note on]: Irish Naturalist, vol. viii, 1899, p. 61. Thompson, S. M.: “The supposed Occurrence of White Lias at Macedon Pt.”: Irish Naturalist, vol. ix, 1900, p. 154. Madame, Christen: “Investigations into the Glacial Drifts of the Northeast of Ireland”: Irish Naturalist, vol. xi, 1902, p. 275. Madame, Christen: “A Summary of the [B.N.F.] Club's recent Glacial Work”: Irish Naturalist, vol. xv, 1906, p. 80.